Spring is here once again! Our sponsor, the George Landis Arboretum, gives us one of the best meeting areas in the Schoharie river valley. They have a nice even building for us to meet in, over 600 acres of land for us to roam through (including fields, old growth forests, and wetlands), and access to the grounds just about any time we would like to have access. The arboretum pays our charter fees. They pay for our right to be a boy scout troop! They don't ask much from us in return. 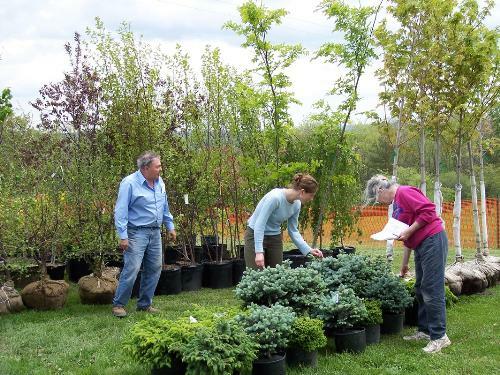 Twice a year the Arboretum hosts a plant sale, one in the spring and one in the fall. A plant sale is right around the corner! 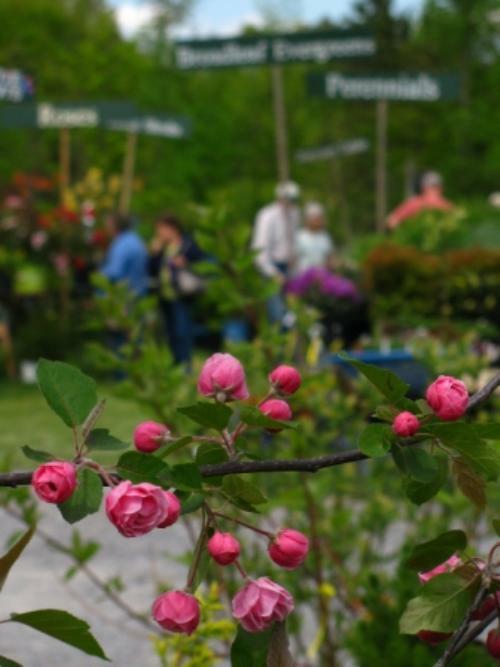 May 19th and 20th from 10 am to 4 pm each day the grounds are open to all those that wish to purchase plants for their property. Hundreds of people come from all over the region to purchase these wonderful plants for their personal enjoyment, be it a single flower or a young maple sapling. 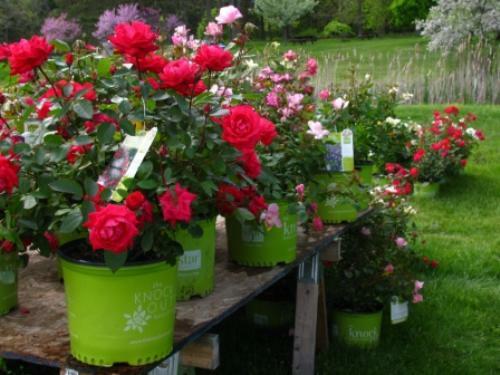 The springsale is the weekend after Mother's Day, the perfect time to be plantingfor the beginning of the growing season. The fall sale is the secondweekend after Labor Day, a wonderful time to be planting perennials.Landis' sale features selections from respected local consignors,plants grown and tenderly potted up by Landis volunteers, and plantsgrown in our own greenhouse. We feature many native plants, and oftenhave a "theme" plant type for the spring sale." Our task is not a complicated one. 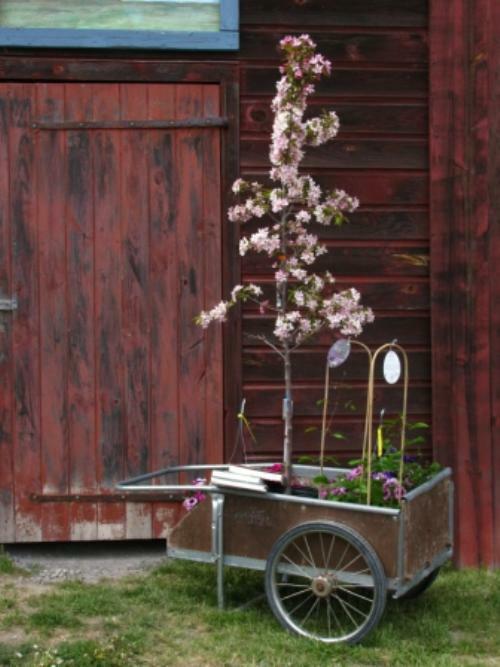 The plant sale customers load wagons, carts, or even their own arms full of the plants they wish to take home. Carts like this are a common load for a single person to take home from this plant sale. Since parking is VERY limited at the bottom of the arboretum, most patrons have to park at the top field near our meeting house. There is a VERY, VERY big hill between the plant sale and the upper parking lot, one that is very difficult to haul loaded carts up. So, we bring the plant laden carts to the lower parking lot while the customers get their vehicles. We meet them in the lower parking lot, help them load their plants, and send them on their way. Some plants are easy for all the scouts to handle. Others (like saplings) will require an older scout/adult or two to easily move. We will not overload you. The two days are divided into 4 time shifts: 10a - 1p and 1p - 4p on each day. Any time you can offer will be very appreciated! Even if it is less than one of these three hour shifts! We will also be providing overnight security on Saturday to make sure that none of the plants walk away on their own. Anyone can spend the night if they wish. We will discuss meals as the sale approaches. As a bonus for your help, the arboretum provides us with a free lunch each day. Often this is an elaborate bag lunch (it's quite good, mini-subs and everything) and you can supplement your meal with goodies from the snack bar in the plant sale. Please bring as much of your class A uniform as you are able, dress to impress! This means neckerchiefs, hats, class A shirt, merit badge sash, OA sash, whatever you can find. A little dirt won't hurt anything and everything is washable. If a ride is needed please let us know and we will find something for the scout!!! I cannot stress this enough!! !